A student enjoys GreenServe 2018’s on-campus project. Photo courtesy of Dr. Andrea Overbay. 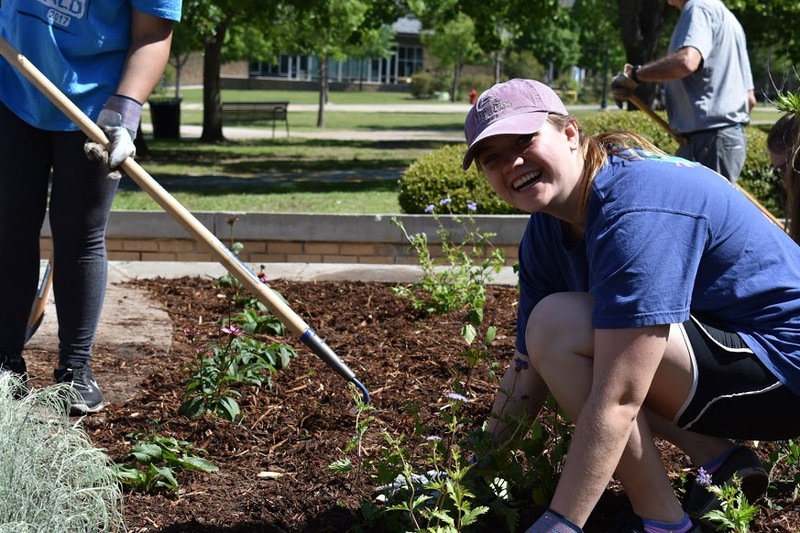 GreenServe 2018 saw the expansion of native plantings on campus. 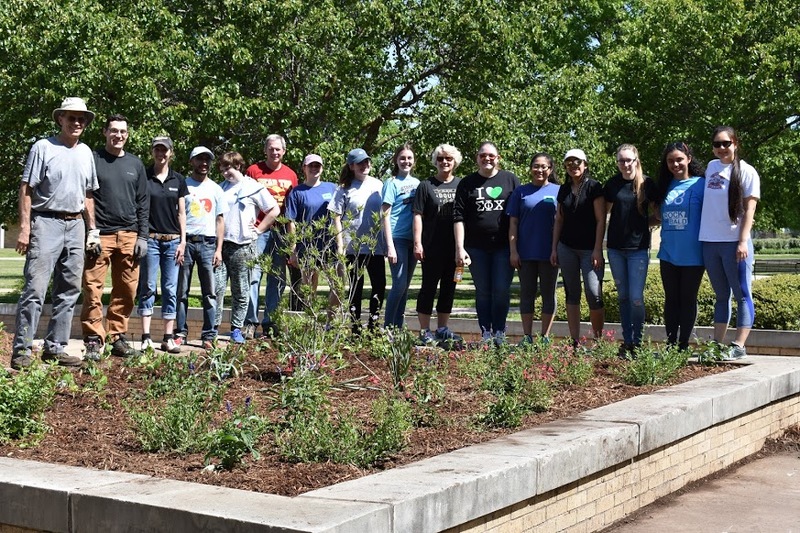 Sixteen volunteers filled an empty bed behind the Abell Library with six different native species selected with the help of Dr. George Diggs. Drs. Peter Schulze, Keith Kisselle, and Mari Elise Ewing helped with the effort alongside Thinking Green Campus Awareness student co-leader Julian Coronado. Even President Steven O’Day and First Lady Cece O’Day dug in and got their hands dirty! President O’Day digs in. 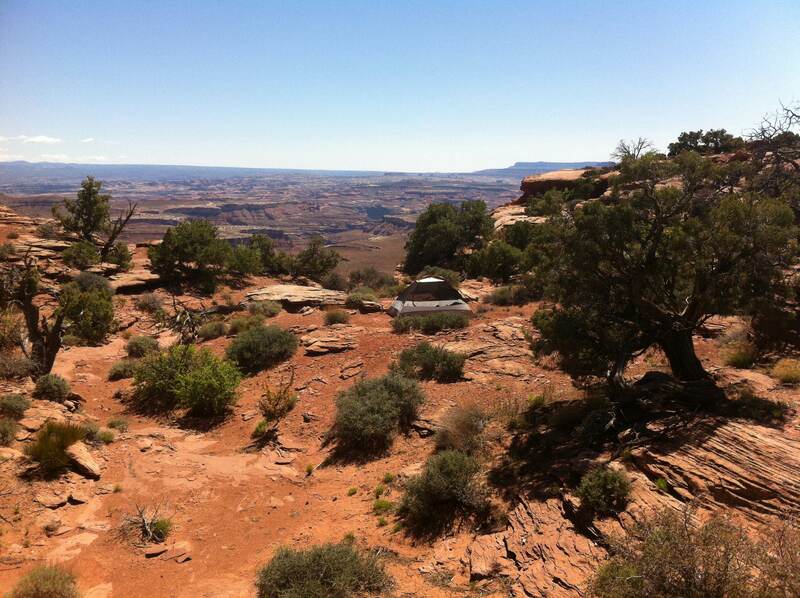 Photo courtesy of Dr. Andrea Overbay. Native pollinator garden volunteers. Photo courtesy of Dr. Andrea Overbay. Austin College President Emeritus Dr. Marjorie Hass and the Board of Trustees launched Austin College Thinking Green in 2011 to serve as an umbrella for all campus greening initiatives. One of the outcomes was the formation of Thinking Green Campus Awareness, a committee of students who identify, organize, and publicize greening activities on campus. Dr. Mari Elise Ewing, Professor of Environmental Studies, serves as the Director, and Katie Collins and Julian Coronado, both seniors, serve as the two student co-leaders for this academic year. 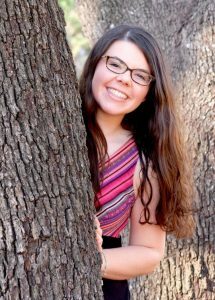 The mission for Thinking Green Campus Awareness is to increase campus participation in environmental responsibility and sustainable utilization of resources so that students will enrich their communities beyond Austin College. Organized by Thinking Green Campus Awareness, GreenServe engages students from around campus in a morning of service focused on environmental responsibility and sustainability. Students volunteer at places like Hagerman National Wildlife Refuge, Eisenhower State Park, both the Sherman and Pottsboro Community Gardens, and elsewhere throughout the Texoma community on projects such as trail maintenance, invasive species control, and habitat restoration. 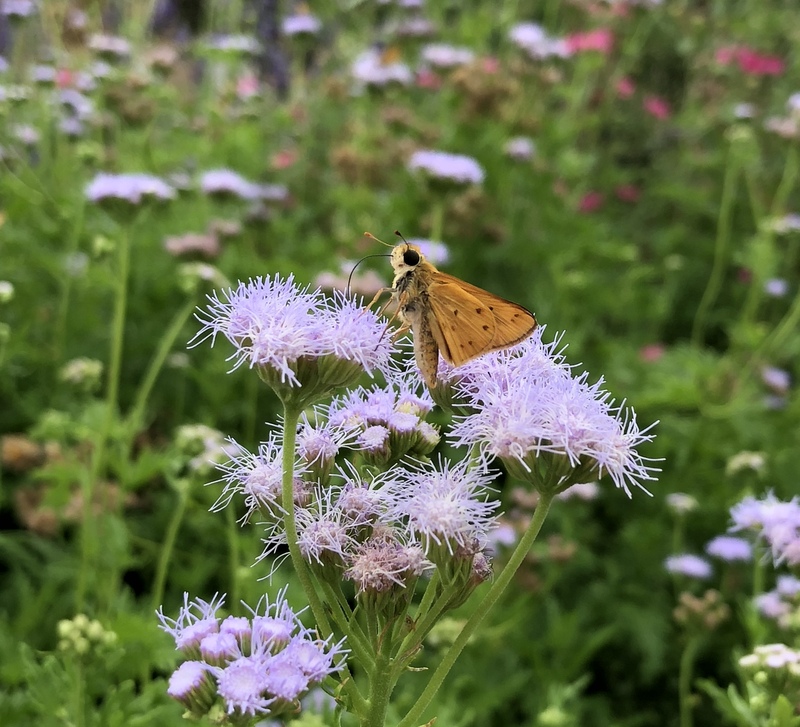 A butterfly hovers over Purple Mistflower. 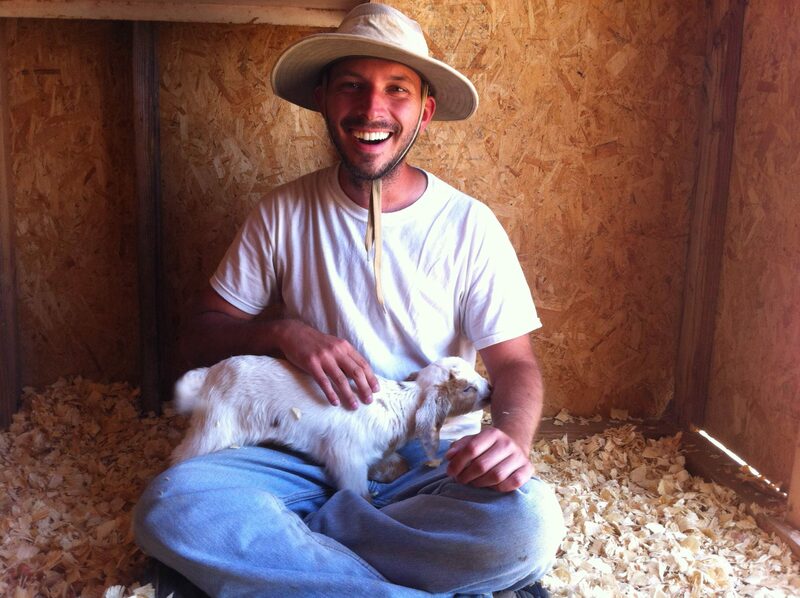 Photo courtesy of Dr. Mari Elise Ewing. GreenServe often includes an on-campus project. For GreenServe 2016, the on-campus project consisted of expanding the native plants around the LEED Gold certified IDEA Center. Ninety volunteers planted over 550 native plants paid for by the Student Sustainability Fund, created in 2011 by a vote of the entire student body and maintained through a five dollar annual student fee. 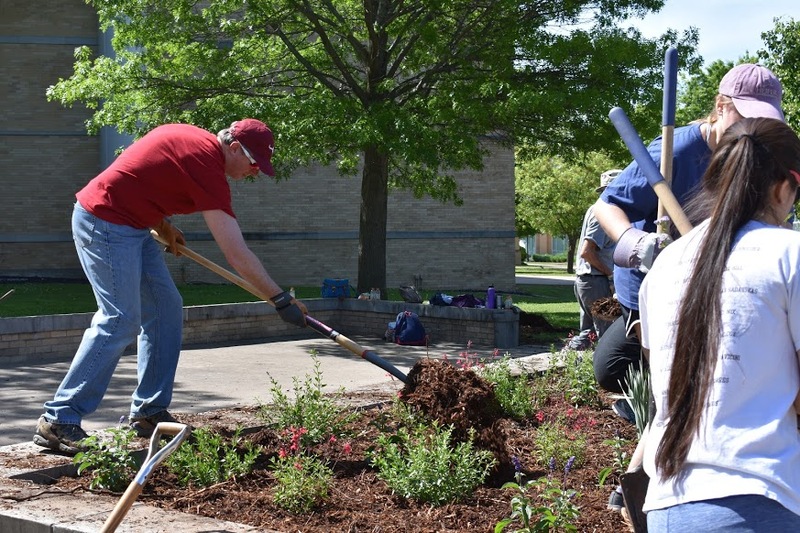 The project increased awareness of and interest in native plants on campus, which lead to GreenServe 2018’s pollinator garden project. 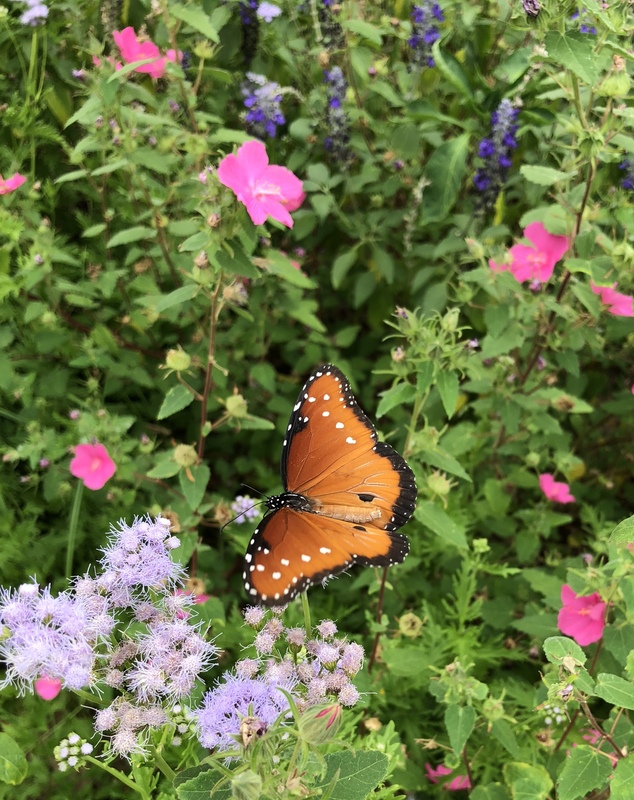 Over the summer, the native plants were in full bloom, drawing numerous butterfly and bee species. 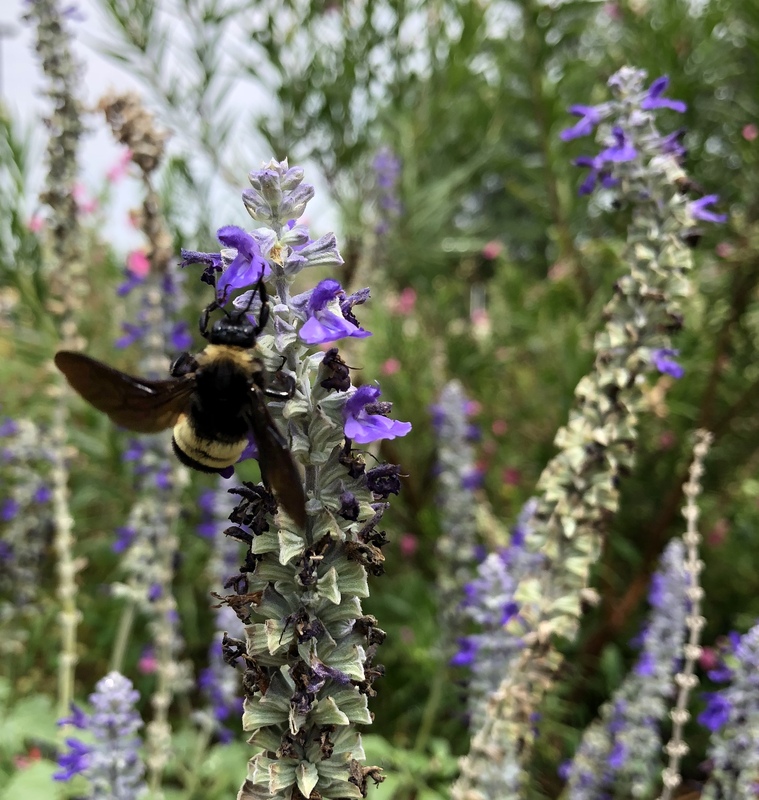 Native plants and pollinators share an important symbiotic relationship, contributing to the health of their ecosystems. Pollinators use the nectar and pollen they gather for food. During foraging, they often carry pollen from one flower to another, which is a vital part of the reproductive cycle for many native plants. Over the years, pollinator populations have declined through habitat loss, disease, and pesticide use. 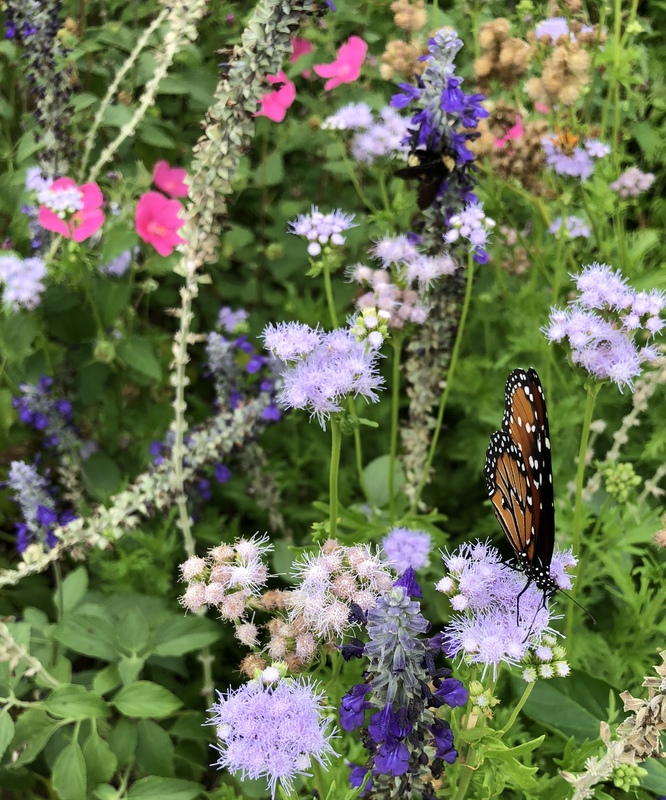 Planting your own pollinator garden is a great way to help pollinator populations recover, and the pollinators are fun to watch! More information can be found at the Natural Resources Conservation Service’s pollinators page. The native plants draw lots of pollinators. Photo courtesy of Dr. Mari Elise Ewing. A bee lights on some Mealy Sage. Photo courtesy of Dr. Mari Elise Ewing. For photographs and more information about the plants listed above as well as other Texas natives, visit UT Austin’s Lady Bird Johnson Wildflower Center webpage. The pollinator garden in full bloom. Photo courtesy of Dr. Mari Elise Ewing. 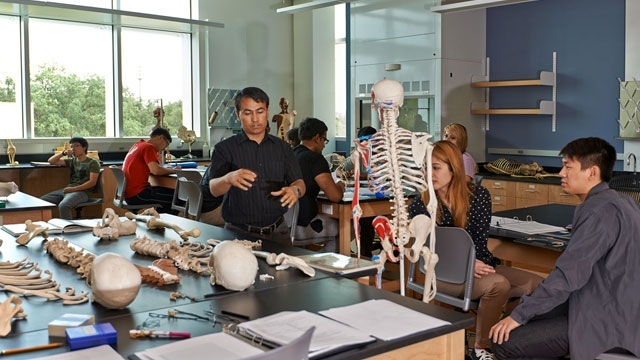 In 2013 the Austin College campus eagerly opened our new science building, the IDEA Center. The 103,000 square foot building includes contemporary classrooms and multi-purpose laboratories that support our experiential science curricula. 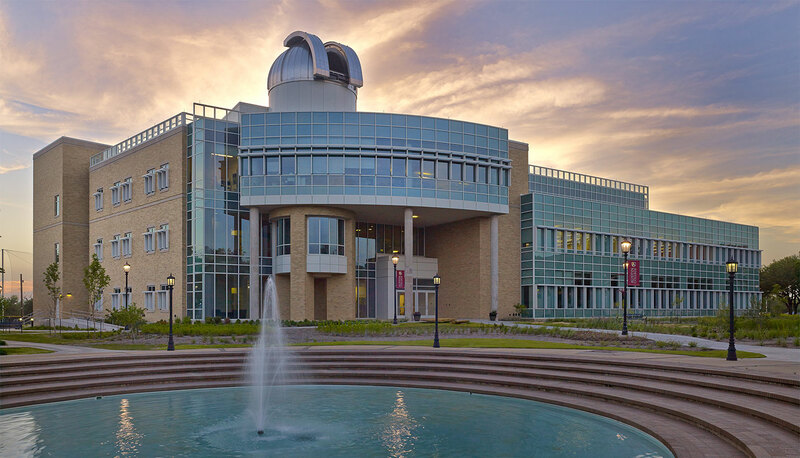 In addition to 32 laboratories, 40 offices, 16 lecture rooms, and a 108-seat auditorium, the Center includes the Adams Observatory that houses a 24-inch telescope and high-resolution camera. The IDEA Center houses the biology, chemistry, computer science, environmental studies, mathematics, and physics programs. On top of the building’s ability to enhance and support the teachings of our faculty, it has also been honored as the first facility in Grayson County. 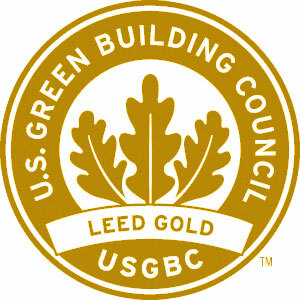 The LEED green building certification system (Leadership in Energy & Environmental Design), managed by the The U.S. Green Building Council awarded the building LEED® Gold certification as a result of its many green design features. Students in anatomy & physiology lab. Responsibly Harvested Materials: 90% of the building’s wood was certified by the Forest Steward Ship Council. This system promotes environmentally sound, socially beneficial and economically prosperous management of the world’s forests. 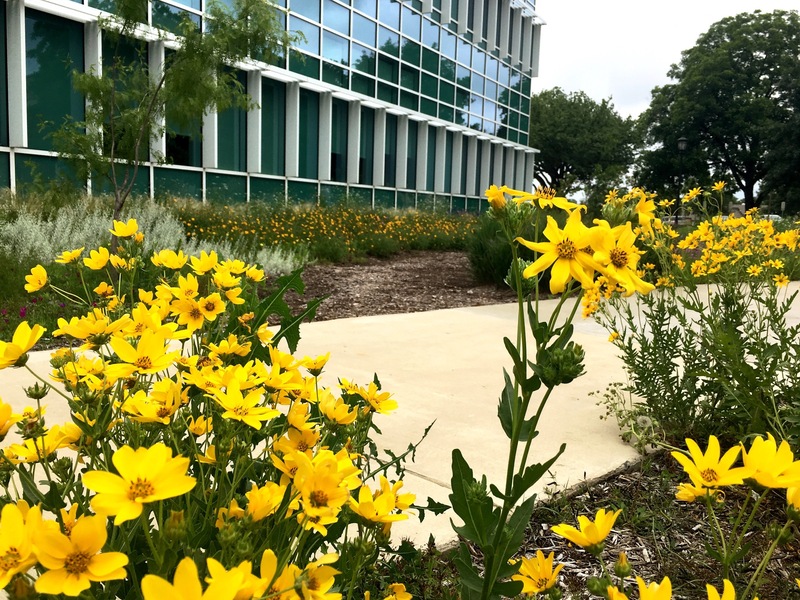 Living Lab: The area around the Center is planted with native Texas grasses and wildflowers. The plants (over 180 species) also reduce water usage by over 50% and support local pollinators. Recently, Austin College volunteers planted hundreds of new plants around the building during GreenServe 2016. Natural Lighting: Classrooms, offices, receive natural light. This provides a comfortable work environment and reduces the need for electric lights. Cool Roof: Light colored roofing (as well as paving) was used to reduce the heat island effect. Water Collection: A 15,000 gallon underground tank collects condensate from the air conditioning system and rain water from the roof. This reduces stormwater runoff and the need for city water for irrigation. Regulated Air Flow: There is precise monitoring and control of indoor air quality and exchange rates. Over 30 fans power the building’s air flow which adjust speed based on air pressure as activity in the building fluctuates. The system closely monitors humidity, keeping it always between 50-60%. All air from laboratories is 100% exhausted so that none makes its way into the main building. Construction Waste: 83% of construction waste was diverted from landfills. Regional materials: 44% of the materials were extracted and manufactured within 500 miles of the project. For example, the building uses stone from Austin, TX and crushed recycled concrete from Lewisville, TX. Native flowers around the IDEA Center.